Pancakes are a fantastic food. Easy to make, delicious hot or cold, and, when it comes to things to put in pancakes, the options are endless. It all starts with a good pancake recipe, one that is simple, nutritious, and easy to play with. I like to use a mix of plain white flour and whole wheat flour in my pancakes. This provides the lightness I want with a toothsome texture and more filling quality. It also works well with a mix of whole wheat and oat flours. If you need to go gluten-free, try a mix of buckwheat and hazelnut or almond flour, with a bit of coconut flour for sweetness and fragrance. 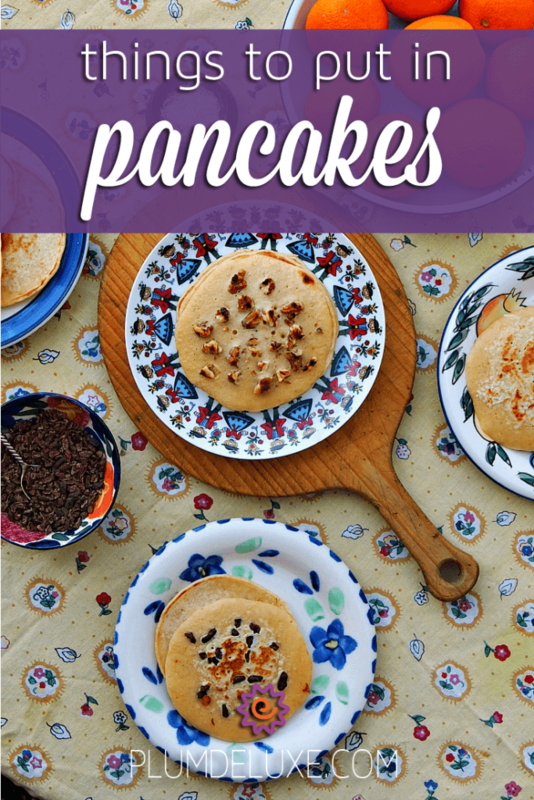 I sweeten my pancake batter with dark brown sugar or real maple syrup that marries well with the whole wheat flour, and a bit of vanilla extract which adds both fragrance and a warming flavor profile. Once your pancake batter is prepared, it’s time to choose things to put in pancakes. 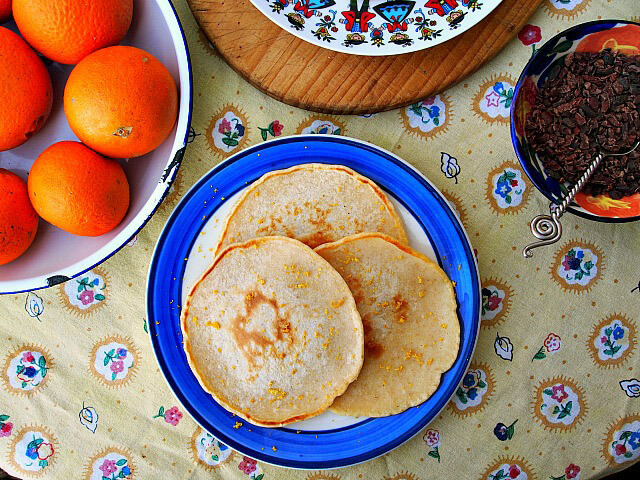 On warm days, I like a light and delicious citrus pancake. Instead of vanilla extract, stir in orange extract and a tablespoon of zest from oranges, mandarins, or clementines. For a topping, try creamy vanilla yogurt and sliced peaches, or a beautiful compote of stewed prunes, dates, and apricots with a hint of nutmeg. Coconut pancakes are also beautiful on a lazy Saturday morning. Simply stir in one cup of desiccated coconut. 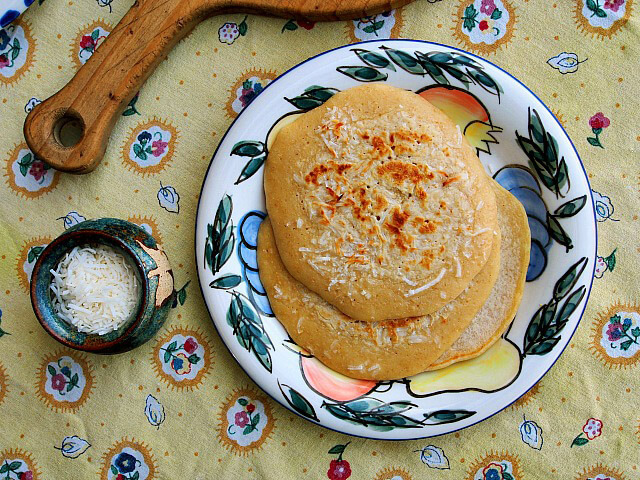 The cooking process lightly toasts the coconut on the outside of the pancakes, adding an even lovelier depth of flavor. For a topping, let the tropics be your inspiration. Add a dollop of custard and some sliced bananas, chopped fresh mango, or a spoonful of passion fruit. Nutty pancakes are my favorite on cold autumn mornings. I like to stir in broken walnuts and pecans, or chopped hazelnuts or macadamia nuts. For nutty pancakes, I prefer a simple topping such as a generous smear of salted butter and a drizzle of real maple syrup. They’re also delicious with thinly sliced apples that have been gently fried in butter, dark brown sugar, and freshly ground cinnamon. While pancakes are usually for laid-back occasions, there are things to put in pancakes that can help them take center stage at an elegant brunch. 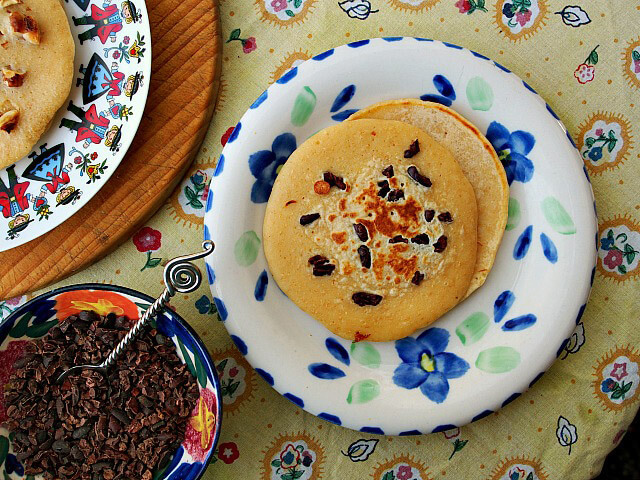 Before cooking these special occasion pancakes, I stir in a generous helping of cocoa nibs. These little beauties add a delightful crunch with only a hint of sweetness. Think of them as chocolate chip pancakes for grown-ups. I like to top them with vanilla-scented whipped cream and halved ripe cherries or sliced fresh strawberries drizzled with real maple syrup. 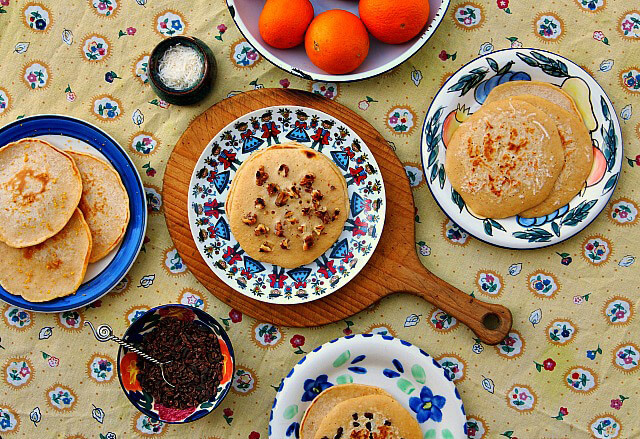 If sweet pancakes aren’t your cup of tea, there are savory things to put in pancakes that are equally delicious. Replace the dark brown sugar with 1 teaspoon of white sugar, then stir in fresh thyme leaves and grated parmesan cheese. Try a teaspoon of freshly ground black pepper, grated cheddar cheese, and smoked ham, or caramelized onions and chopped sage. Whisk together all ingredients until smooth. Lightly grease frying pan and place over medium high heat. Pour batter into pan 1/4 cup at a time. Cook 1-2 minutes or until bubbles form on top. Flip carefully and cook another minute.